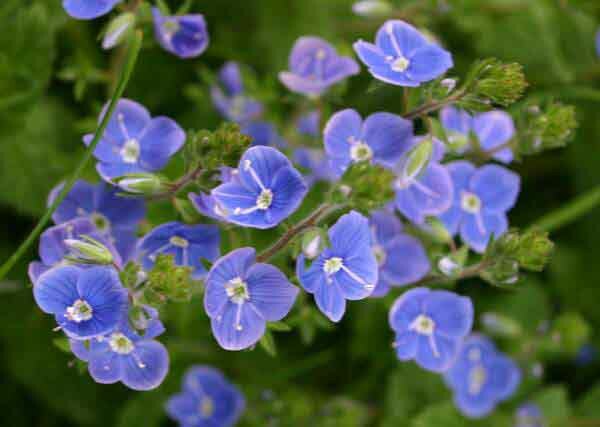 Unless supported by grasses or other strong-stemmed plants, Germander Speedwell is a sprawling, low perennial. Distinguished by its pointed oval leaves, always in opposite pairs and markedly toothed, Germander Speedwell grows to a height of 20c. A distinguishing feature is the presence of two lines of fine white hairs on opposite sides of the stems. The flowers, 8 to 11mm across, are various shades of sky blue,(occasionally mauve or pale violet) with a white central eye. Germander Speedwell is common and widespread throughout Britain and Ireland, and it is equally common throughout most of northern and central mainland Europe, becoming incleasingly localised towards the far south. As an introduced alien species this plant can be seen in some parts of North America. This pretty little wildflower manages to grow in a variety of situations. We find it in meadows, in hedgerows, in sparse deciduous woodland and on mountain slopes. 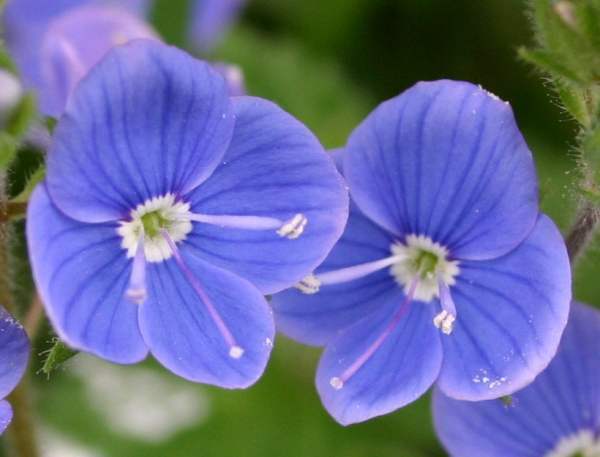 On steep banks beside shady roadside verges Germander Speedwell sometimes outshines even the Bluebells and Dog Violets with its abundance of cheerful blue flowers. 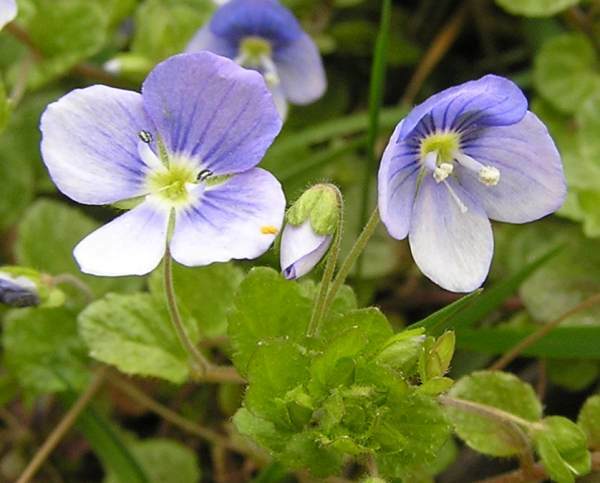 There are many Veronica species and separating them requires careful inspection of many characters; for example Germander Speedwell is often confused with Veronica filiformis, commonly known as Slender Speedwell or Creeping Speedwell (pictured below). Above: Veronica filiformis, Creeping Speedwell. In Britain Germander Speedwell blooms from April until at least July, but the most prolific displays are nearly always in late April and early May. In the past the various speedwells (of which there are many in Britain and Ireland) were classified in the family Scrophulariaceae. DNA analysis has shown that the vast array of species (some 5000 worldwide) formerly placed in the family Scrophulariaceae (the Figwort family) are not monophyletic (truly close relatives), and many genera have been transferred to other families within the Lamiales - some, as with the speedwells, are now in the family Plantaginaceae (the Plantain family); others have joined the broomrapes within the Orobanchaceae; but several new families have also been set up to accommodate groups of former 'Scrophs'. The leaves of Germander Speedwell have been used in the past to make an expectorant tea for treating bronchial congestion and asthema. The common name Speedwell may be a reference to the claimed rapid effectiveness of this plant when used as a medication. Speedwells were considered lucky charms, their sight speeding travellers on their way. Veronica, the genus name, probably comes from the Latin adjective vera- meaning true, and -nica meaning image. When St. Veronica wiped Christ's forehead on they way to his crucifixion on Mount Calvary, an image of his face was said to have been left on the cloth she had used. The specific epithet chamaedrys means 'charisma, or gift'. The origin of the common name Germander is variously attributed to a corruption of the Latin chamaedrys - or to the Greek chamai, which means 'on the ground'. One of the other common names for this plant is Bird's Eye Speedwell. Brooklime Veronica beccabunga grows in the edges of streams and ditches; it has thick stems, dark green leaves and sparse flowers. The plants shown on this page were photographed in West Wales in May and June.